Mehrangiz Kar speaks about women's rights and failures of justice in Iran. Photo by David J. Hawkins. Nayereh Tohidi, director of CSUN's Middle Eastern Studies Program, spoke at the outset of the event. Photo by David J. Hawkins. 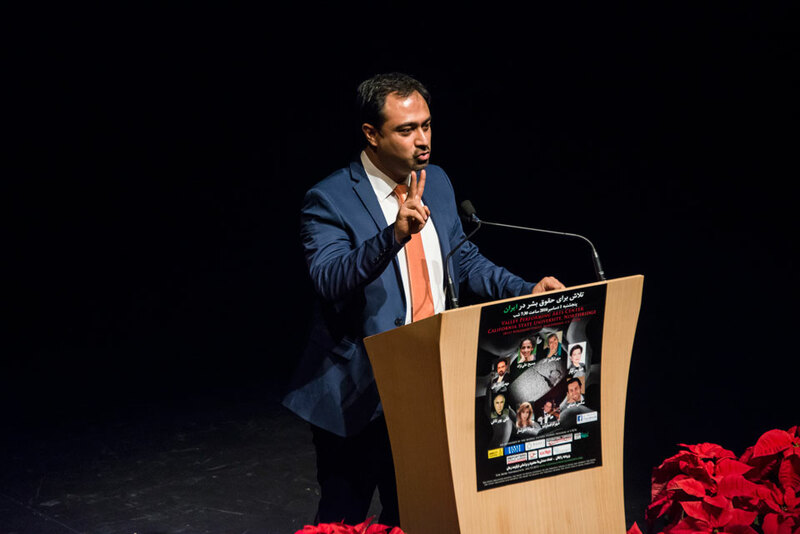 Iranian activists, writers, comedians, actors and musicians addressed the need for social reform in their homeland, during the Striving for Human Rights in Iran lecture at the Valley Performing Arts Center at California State University, Northridge. 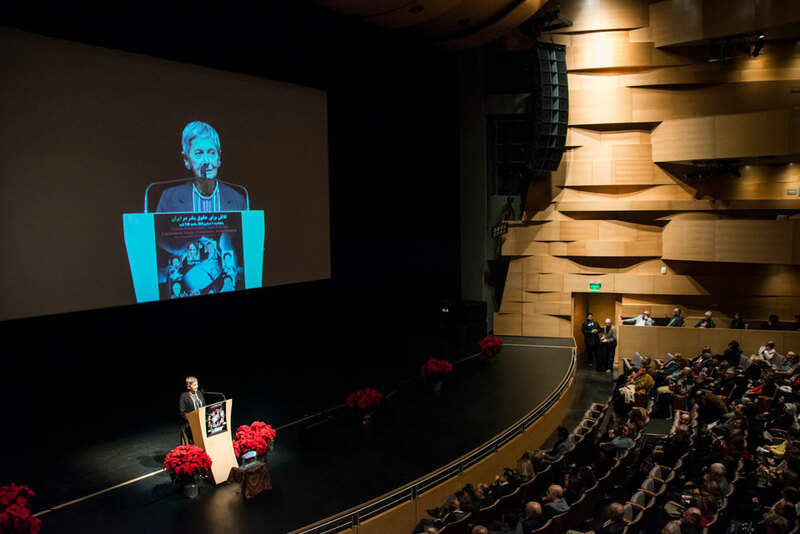 The free event was co-sponsored by CSUN’s Middle Eastern and Islamic Studies Program and focused on human rights violations committed by the Iranian government against its citizens, while highlighting the importance of activism and the international push for positive change in Iran. The speakers communicated almost solely in Farsi, with simultaneous English translation provided for non-Farsi speakers via headphones. The evening marked the seventh year for this seminar, according to planning committee member Elhum Vahdat. The events are held exclusively in the Los Angeles area, but feature speakers from around the globe. Themes of togetherness and an emphasis on the power of grassroots change echoed throughout the event. Though several speakers cited individual voices and actions as key, there was agreement that a sizable, international groundswell could prove invaluable in sparking lasting, widespread change. Journalist Masih Alinejad discussed how activists must treat the marginalization of women in Iranian society as a global women’s issue, especially the government-imposed wearing of hijab, a traditional women’s headscarf. Alinejad was quick to assert that Iranian women don’t need saving from their oppressors, though. Instead, she called for allies to stand beside them in solidarity. The panelists called on Iran’s government to respect freedom of individual expression and repeal laws that discriminate against women and marginalized groups — or those that carry heavy-handed punishments. “When the government is less progressive than the culture of the people, the government pulls us down,” said attorney, activist and visiting CSUN professor Mehrangiz Kar. Speakers at the event also pleaded for an end to civil strife in Iran, asking citizens to put aside their differences and abandon outdated mindsets and practices. 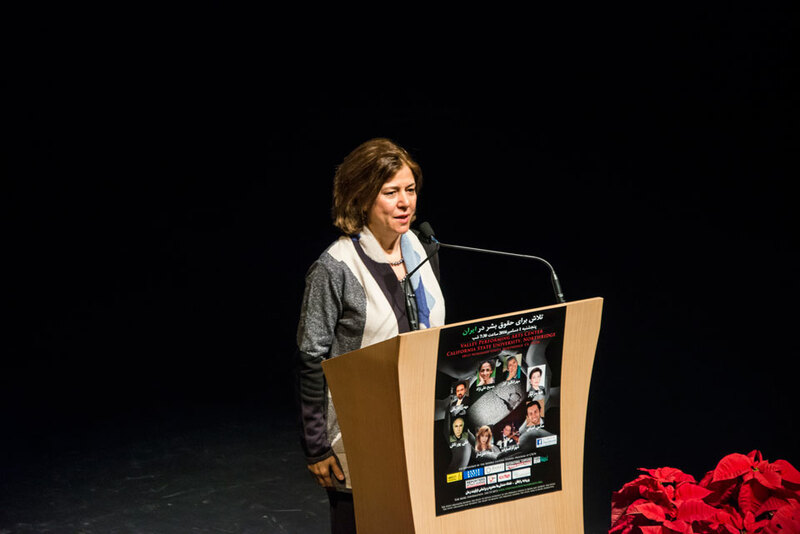 Author and journalist Homa Sarshar served as mistress of ceremonies for the event, which also featured an introductory speech by Nayereh Tohidi, director of CSUN’s Middle Eastern and Islamic Studies Program, as well as a performance by singer Shahla Sarshar and violinist Shahram Fasazadeh. Comedians and actors Ali Pourtash and Max Amini also spoke to the audience. Amini capped the night with a series of light-hearted accounts that elicited laughter from the crowd and helped balance the comparatively solemn subject matter that dominated the evening. He began his set with a quip about how he felt out of place, given the strong speakers who preceded him, but ended with a harmonious message that complemented their sentiments.